This is a timeline of the War in Donbass, for November 2018. 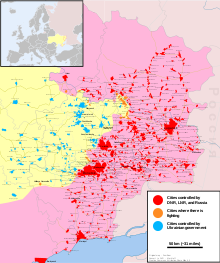 The timeline follows an ongoing conflict between Ukraine and anti-government pro-Russian separatists supported by Russia in the Donbass region in eastern Ukraine. The spokesman of the Ukrainian operational headquarters reported in the morning, that pro-Russian troops had opened fire on 24 occasions on Ukrainian positions the previous day (including on 17 occasions in Donetsk region and on 7 occasions in Luhansk region); the fire was returned on 11 occasions. By morning of 1 November (as of 9:00 am) one ceasefire violation was registered with no casualties on the Ukrainian side; the fire was returned. The spokesman of the Ministry of Defence confirmed at noon that two Ukrainian servicemen were wounded in the Donbass region on the last day of October. Pro-Russian officials at Donetsk city reported 26 Ukrainian violations of the ceasefire in 13 locations using small arms, heavy machine guns, automatic grenade launchers, 73 mm antitank recoilless rifles and 82 mm mortars. According to local sources, the Ukrainian military broke the ceasefire twice within the borders of the self-styled Luhansk People's Republic. Self-propelled artillery from Krymske engaged pro-Russian redoubts at Zholobok, while 82 mm mortars from the same position were used to shell Smile. According to the information provided by the press-centre of the JFO in the evening, pro-Russian military had opened fire on positions of Ukrainian troops on 8 occasions. By the end of the day total 20 ceasefire violations were registered, one Ukrainian serviceman was killed in action, two were wounded. Pro-Russian authorities from Donetsk city reported a series of Ukrainian violations of the ceasefire. Oleksandrivka, Donetsk airport, Spartak, Kruta Balka, Yasynuvata and Volvo Center, in the surroundings of Donetsk city, Zaitseve and Gagarin mining complex, in the area of Horlivka, and, in the region of Mariupol, Sakhanka, Pikuzy and Uzhivka, came under attack. Most incidents involved the use of infantry weapons and automatic grenade launchers. Ukrainian troops at Opytne fired a 120 mm mortar at Donetsk airport. BMP-1 armoured vehicles from Pisky opened fire on the industrial area of Volvo Center. 73 mm antitank recoilless rifles were fired at Yasynuvata, Pikuzy and Spartak. According to the information provided by the spokesman of the Ukrainian operational headquarters in the morning, pro-Russian troops had opened fire on 20 occasions on Ukrainian positions the previous day (including on 17 occasions in Donetsk region and on 3 occasions in Luhansk region); the fire was returned on about 10 occasions. By morning of 2 November three ceasefire violations were registered with no casualties on the Ukrainian side. The spokesman of the Ministry of Defence reported at noon that one Ukrainian serviceman (born in 1994) was lethally wounded and another two were wounded in the Donbass region on the first day of November. Pro-Russian officials at Donetsk city reported 23 Ukrainian violations of the ceasefire in 12 locations using small arms, heavy machine guns, snipers, automatic grenade launchers, 73 mm antitank recoilless rifles, 120 mm mortars, armoured personnel carriers and armoured fighting vehicles. In the course of the past week, Ukrainian forces broke the ceasefire on 141 occasions, firing nine 122 mm artillery rounds and 99 shells from 82 mm and 120 mm mortars. No violations of the ceasefire were reported by authorities from the self-styled Luhansk People's Republic. The press-centre of the JFO reported in the evening that pro-Russian military had opened fire on positions of Ukrainian troops on 7 occasions. By the end of the day total 22 ceasefire violations were registered with no casualties on the Ukrainian side. Pro-Russian sources from Donetsk city told the press that Ukrainian forces had broken the ceasefire on several occasions by evening. Yasynuvata, Trudivske, Kruta Balka, Staromykhailivka, Spartak, Vasylivka, Lozove and Oleksandrivka, in the area of Donetsk city, Holmivsky, Gagarin mining complex and Zaitseve, in the outskirts of Horlivka, and, in the region of Mariupol, Sakhanka and Uzhivka, came under hostile fire. In the main incidents, 82 mm mortar rounds landed in Spartak and Uzhivka, while BMP-1 armoured vehicles from Shyrokyne opened fire on Sakhanka. BMP-2 armoured vehicles from Travneve attacked Holmivsky, and ZU-23-2 antiaircraft guns were fired at Yasynuvata. Yasynuvata later became the target of BMP-2 armoured vehicles firing from Avdiivka. The spokesman of the Ukrainian operational headquarters reported in the morning, that pro-Russian troops had opened fire on 22 occasions on Ukrainian positions the previous day; the fire was returned on 14 occasions. By morning of 3 November (as of noon) four ceasefire violations were registered, as a result, one Ukrainian soldier was wounded. The spokesman of the Ministry of Defence reported at noon no casualties in the Donbass region on 2 November. Pro-Russian authorities at Donetsk city reported 19 Ukrainian violations of the ceasefire in ten locations using small arms, heavy machine guns, grenade launchers, 73 mm antitank recoilless rifles, 82 mm mortars, antiaircraft guns, armoured personnel carriers and armoured fighting vehicles. According to local sources, the Ukrainian military broke the ceasefire twice within the borders of the self-proclaimed Luhansk People's Republic, when Ukrainian forces shelled pro-Russian troops at Knyaz Igor memorial and Zholobok with 82 mm mortars. According to the information provided by the press-centre of the JFO in the evening, pro-Russian military had opened fire on positions of Ukrainian troops on 11 occasions, another Ukrainian serviceman was wounded. By the end of the day a total 20 ceasefire violations were registered. Several violations of the truce carried out by Ukrainian forces were reported by pro-Russian authorities at Donetsk city. The Ukrainian military attacked Oleksandrivka, Zhabicheve, Volvo Center, Trudivske, Kruta Balka, Yasynuvata and Spartak, in the outskirts of Donetsk city, Gagarin mining complex and Zaitseve, in the area of Horlivka, and, in the region of Mariupol, Sakhanka, Zaichenko and Pikuzy. Most incidents involved the use of infantry weapons and automatic grenade launchers. According to the information provided by the spokesman of the Ukrainian operational headquarters in the morning, pro-Russian troops had opened fire on 20 occasions on Ukrainian positions the previous day (including on 17 occasions in Donetsk region and on 3 occasions in Luhansk region); the fire was returned on several occasions. By morning of 4 November (as of noon) ten ceasefire violations were registered, as a result, one Ukrainian serviceman was wounded; the fire was returned on several occasions. The spokesman of the Ministry of Defence confirmed at noon that two Ukrainian soldiers were wounded in the Donbass region on 3 October. Pro-Russian authorities at Donetsk city reported 16 Ukrainian violations of the ceasefire in 12 locations using small arms, heavy machine guns, automatic grenade launchers and 73 mm antitank recoilless rifles. Officials from the self-proclaimed Luhansk People's Republic recorded one Ukrainian violation of the truce within the republic boundaries, when Ukrainian forces from Svitlodarsk shelled Lozove with 73 mm antitank recoilless rifles. The press-centre of the JFO reported in the evening that pro-Russian military had opened fire on positions of Ukrainian troops on 14 occasions, as a result, one Ukrainian serviceman was killed and another two were wounded. By the end of the day total 18 ceasefire violations were registered, one more Ukrainian serviceman was wounded. In the environs of Donetsk city, pro-Russian troops fired infantry weapons, grenade launchers and 82 mm mortars at Lebedinske, Pavlopil, Avdiivka, Hnutove and Vodiane. In the northern sector of the demarcation line. Most incidents took place in the rural settlement of Vilnyi (ESE part of Zolote, 48°40′59″N 38°33′2″E﻿ / ﻿48.68306°N 38.55056°E﻿ / 48.68306; 38.55056), near Popasna, where Ukrainian positions were engaged by pro-Russian armoured fighting vehicles supported by 82 mm and 120 mm mortar fire. Zolote was struck by 120 mm mortars, while Novotoshkivke came under 82 mm mortar fire. Automatic grenade launchers and under-barrel launched grenades were used to harass Ukrainian forces at Krymske. Pro-Russian sources from Donetsk city reported a number of Ukrainian violations of the truce by evening. Spartak, Staromykhailivka and Trudivske, in the outskirts of Donetsk city, Hlubokaya coal mine, in the area of Horlivka, and, in the region of Mariupol, Bezimenne, Sakhanka and Uzhivka, came under attack. In the main incidents, Bezimenne was shelled by 82 mm mortars, 120 mm mortars and 122 mm self-propelled artillery, while 120 mm mortar volleys landed in Sakhanka and Uzhivka; both locations also became the target of 82 mm mortars. BMP-2 opened fire on pro-Russian positions at Hlubokaya coal mine. The spokesman of the Ukrainian operational headquarters reported in the morning, that pro-Russian troops had opened fire on 18 occasions on Ukrainian positions the previous day (including on 13 occasions in Donetsk region and on 5 occasions in Luhansk region); the fire was returned on several occasions. By morning of 5 November two ceasefire violations were registered with no casualties on the Ukrainian side. The spokesman of the Ministry of Defence confirmed at noon that one Ukrainian serviceman was killed and four were wounded in the Donbass region on 4 November. Pro-Russian officials at Donetsk city reported 15 Ukrainian violations of the ceasefire in six locations using small arms, heavy machine guns, snipers, automatic grenade launchers, 73 mm antitank recoilless rifles, 120 mm mortars, armoured personnel carriers, armoured fighting vehicles and 122 mm self-propelled artillery. According to local sources, the Ukrainian military broke the ceasefire seven times within the borders of the self-styled Luhansk People's Republic. The Ukrainian military employed small arms, heavy machine guns, automatic grenade launchers, antitank recoilless rifles, 82 mm mortars, 120 mm mortars and BMP-1 armoured vehicles to engage pro-Russian positions at Holubovske, Smile, Zolote, Mariivka, Lozove and Donetskyi. According to the information provided by the press-centre of the JFO in the evening, as of 6:00 pm pro-Russian military had opened fire on positions of Ukrainian troops on 5 occasions. By the end of the day total 14 ceasefire violations were registered with no casualties on the Ukrainian side. In the surroundings of Donetsk city and Mariupol, 120 mm mortar rounds hit Pevlopil. Small arms, heavy machine guns and rocket launchers were fired at Ukrainian positions around Hnutove, Krasnohorivka, Pavlopil and Novomykhailivka, In the northern sector of the demarcation line, antitank rockets landed in Luhanske, while Ukrainian troops at Khutora Vilnyi and Novoluhanske were harassed with small arms fire. A series of Ukrainian violations of the ceasefire were reported by pro-Russian authorities at Donetsk city. Yasynuvata, Trudivske, Mineralne, Spartak, Kruta Balka, Kashtanove, Staromykhailivka, Abakumove coal mine and Luhanske, in the surroundings of Donetsk city, and, in the area of Horlivka, Holmivsky, Izotove coal mine and Zaitseve, came under attack. In the main incidents, 120 mm mortar rounds landed in Mineralne, while 82 mm mortar volleys hit Spartak and Luhanske. BMP-1 and BMP-2 armoured vehicles from Krasnohorivka attacked pro-Russian positions at Staromykhailivka. BMP-1 armoured vehicles from Slavne opened fire on Luhanske, while BMP-2 armoured vehicles from Travneve riddled pro-Russian redoubts at Holmivsky. Kruta Balka was targeted by ZU-23-2 antiaircraft guns. According to the information provided by the spokesman of the Ukrainian operational headquarters in the morning, pro-Russian troops had opened fire on 14 occasions on Ukrainian positions the previous day (including on 11 occasions in Donetsk region and on 3 occasions in Luhansk region); the fire was returned on 6 occasions. By morning of 6 November (as of noon) two ceasefire violations were registered, with no casualties on the Ukrainian side, the fire was returned on all occasions. The spokesman of the Ministry of Defence reported at noon no casualties in the Donbass region on 5 November. Pro-Russian authorities at Donetsk city reported 17 Ukrainian violations of the ceasefire in 14 locations using small arms, heavy machine guns, automatic grenade launchers, 73 mm antitank recoilless rifles, 82 mm mortars, 120 mm mortars, antiaircraft guns, armoured personnel carriers and armoured fighting vehicles. Officials from the self-proclaimed Luhansk People's Republic recorded four Ukrainian violations of the truce within the republic boundaries. Ukrainian forces employed heavy machine guns, automatic grenade launchers, rocket launchers, 73 mm antitank recoilless rifles, 82 mm mortars and BMP-1 armoured vehicles to engage pro-Russian forces at Lozove, Kalynivka and Zholobok. A Ukrainian drone was shot down by pro-Russian forces while on a surveillance mission over Mykhailivka. The press-centre of the JFO reported in the evening that pro-Russian military had opened fire on positions of Ukrainian troops on 7 occasions. Grenade launchers of different calibres, automatic grenade launchers, heavy machine guns, and small arms were used to target Ukrainian positions near Krymske, Zaitseve, Novhorodske and Shumy, in the northern section of the demarcation line, and, in the outskirts of Donetsk city and in the region of Mariupol, Pisky, Marinka, Starohnativka, Verkhnyotoretske and Pavlopil; one Ukrainian serviceman was wounded as a result. By the end of the day total 10 ceasefire violations were registered. The spokesman of the Ukrainian operational headquarters reported in the morning, that pro-Russian troops had opened fire on 10 occasions on Ukrainian positions the previous day (including on 6 occasions in Donetsk region and on 4 occasions in Luhansk region); the fire was returned on almost all occasions. By morning of 7 November (as of noon) two ceasefire violations were registered with no casualties on the Ukrainian side; the fire was returned. The spokesman of the Ministry of Defence confirmed at noon that one Ukrainian serviceman was wounded in action in the Donbass region on 6 November. Pro-Russian officials at Donetsk city reported 16 Ukrainian violations of the ceasefire in nine locations using small arms, heavy machine guns, snipers, automatic grenade launchers, 73 mm antitank recoilless rifles, 82 mm mortars, 120 mm mortars, antiaircraft guns and 122 mm self-propelled artillery. No incidents were reported by local sources in the self-proclaimed Luhansk People's Republic. According to the information provided by the press-centre of the JFO in the evening, pro-Russian military had opened fire on positions of Ukrainian troops on 7 occasions, as a result, one Ukrainian soldier was wounded. By the end of the day total 19 ceasefire violations were registered, another two Ukrainian servicemen were wounded. In the outskirts of donetsk city and in the region of Mariupol, pro-Russian armoured fighting vehicles engaged Ukrainian positions at Pavlopil, supported by 82 mm mortars and ZU-23-2 antiaircraft guns. The separatists employed infantry weapons and rocket lanchers to harass Ukrainian troops at Avdiivka, Pisky, Krasnohorivka, Novomykhailivka, Hnutove, Pavlopil and Lebedinske. In the northern section of the demarcation line, 82 mm and 120 mm mortar volleys landed in Luhanske, while small arms, heavy machine guns and grenade launchers were used to attack Ukrainian forces at Zaitseve and Khutora Vilnyi. Small arms fire was reporetd at Stanytsia Luhanska. Pro-Russian authorities from Donetsk city told the press that Ukrainian forces had broken the ceasefire on several occasions throughout the day. Yasynuvata, Spartak, Kashtanove, Kruta Balka, Trudivske and Mineralne, in the environs of Donetsk city, Zaitseve, in the area of Horlivka, and Sakhanka, in the region of Mariupol. Most incidents involved the use of infantry weapons and automatic grenade launchers. A drone strike hit Mineralne later in the evening; the unmanned aircraft was shot down by ground forces. One civilian resident was wounded. Kruta Balka and Yasynuvata became the target of 73 mm antitank recoilless rifles. According to the information provided by the spokesman of the Ukrainian operational headquarters in the morning, pro-Russian troops had opened fire on 19 occasions on Ukrainian positions the previous day (including on 15 occasions in Donetsk and on 4 occasions in Luhansk region); the fire was returned on 10 occasions. By morning of 8 November (as of noon) two ceasefire violations were registered with no casualties on the Ukrainian side. The spokesman of the Ministry of Defence confirmed at noon that three Ukrainian servicemen were wounded in the Donbass region on 7 November. Pro-Russian officials at Donetsk city reported 15 Ukrainian violations of the ceasefire in nine locations using small arms, heavy machine guns, snipers, automatic grenade launchers, 73 mm antitank recoilless rifles and drones. Officials from the self-proclaimed Luhansk People's Republic recorded two Ukrainian violations of the truce within the republic boundaries, when Ukrainian forces attacked Raevka and Mariivka with heavy machine guns, 73 mm antitank recoilless rifles and 82 mm mortars. The press-centre of the JFO reported at 6:00 pm that pro-Russian military had opened fire on positions of Ukrainian troops on 7 occasions, one Ukrainian serviceman was wounded. By the end of the day total 14 ceasefire violations were registered, another Ukrainian serviceman was wounded as a result. In the outskirts of Donetsk city and in the region of Mariupol, 82 mm mortars were fired at Pavlopil and Slavne, the separatists used infantry weapons and rocket launchers to harass Ukrainian troops at Lebedinske, Starohnativka, Chermalyk, Opytne, Pisky, Krasnohorivka and Pavlopil. In the northern sector of the demarcation line, Novoluhanske was hit by 120 mm mortar rounds, and Krymske came under 82 mm mortar fire. Infantry weapons and grenade launchers were also fired at Krymske. Pro-Russian sources from Donetsk city told the press that Ukrainian forces had broken the ceasefire on several occasions by evening. Volvo Center, Trudivske, Kruta Balka, Lozove, Spartak, Oleksandrivka, Vasylivka, Kashtanove and Mineralne, in the area of Donetsk city, Zaitseve, Dolomitne, Holmivsky and Gagarin mining complex, in the outskirts of Horlivka, and, Uzhivka, in the region of Mariupol, came under hostile fire. In the main incidents, Volvo Center came under 120 mm mortar fire, while BMP-1 armoured vehicles from Marinka and Shumy opened fire on pro-Russian redoubts at Trudivske and Gagarin mining complex, respectively. Gagarin was also hit by 82 mm mortar rounds, and ZU-23-2 antiaircraft guns were simultaneously fired at Trudivske. BMP-2 armoured vehicles from Travneve riddled pro-Russian positions at Dolomitne and Holmivsky with 30 mm gunfire. Kashtanove was also attacked by BMP-2 armoured vehicles from Avdiivka. Ukrainian forces at Mineralne received fire from Zu-23-2 antiaircraft cannons. The spokesman of the Ukrainian operational headquarters reported in the morning, that pro-Russian troops had opened fire on 14 occasions on Ukrainian positions the previous day (including on 11 occasions in Donetsk region and on 3 occasions in Luhansk region); the fire was returned on 7 occasions. By noon of 9 November one ceasefire violation was registered with no casualties on the Ukrainian side; the fire was returned. The spokesman of the Ministry of Defence confirmed at noon that two Ukrainian servicemen were wounded in action in the Donbass region on 8 November. Pro-Russian sources at Donetsk city recorded 19 Ukrainian violations of the ceasefire in 17 locations using small arms, heavy machine guns, automatic grenade launchers, 73 mm antitank recoilless rifles, 82 mm mortars, 120 mm mortars, antiaircraft guns, armoured personnel carriers and armoured fighting vehicles. It was also reported that during the past week, Ukrainian forces broke the ceasefire on 116 occasions, and fired 122 mm self-propelled artillery and 100 rounds from 82 mm and 120 mm mortars. The Ukrainian military also employed armoured fighting vehicles. Authorities from the self-proclaimed Luhansk People's Republic recorded four Ukrainian violations of the truce within the republic boundaries. Ukrainian forces employed heavy machine guns, automatic grenade launchers, 73 mm antitank recoilless rifles, 82 mm mortars, 120 mm mortars and BMP-1 armoured vehicles to engage pro-Russian forces at Sentianivka, Lozove, Mariivka and Kalynivka. According to the information provided by the press-centre of the JFO in the evening, pro-Russian military had opened fire on positions of Ukrainian troops on 4 occasions. By the end of the day total 9 ceasefire violations were registered, two Ukrainian servicemen were lethally wounded as a result. A series of Ukrainian violatons of the ceasefire were reported by pro-Russian sources at Donetsk city. Ukrainian forces attacked Kruta Balka, Trudivske, Yasynuvata, Oleksandrivka, Spartak, Volvo Center, Donetsk airport, Zhabicheve, in the outskirts of Donetsk city, and, in the region of Mariupol, Sakhanka and Uzhivka. In the main incidents, 152 mm self-propelled artillery from Pisky shelled the industrial area of Volvo Center. Zhabicheve, Donetsk airport and Spartak were hit by 82 mm mortar fire. BMP-1 armoured vehicles from Shyrokyne and Pisky engaged pro-Russian positions at Sakhanka and Zhabicheve, respectively. According to the information provided by the spokesman of the Ukrainian operational headquarters in the morning, pro-Russian troops had opened fire on 9 occasions on Ukrainian positions the previous day (including on 5 occasions in Donetsk region and on 4 occasions in Luhansk region); the fire was returned on all occasions. By noon of 10 November two ceasefire violations were registered with no casualties on the Ukrainian side. The spokesman of the Ministry of Defence confirmed at noon that two Ukrainian servicemen were killed by shelling in the Donbass region on 9 November. Pro-Russian authorities at Donetsk city reported 22 Ukrainian violations of the ceasefire in nine locations using small arms, heavy machine guns, automatic grenade launchers, 73 mm antitank recoilless rifles, 82 mm mortars, 120 mm mortars, armoured personnel carriers, armoured fighting vehicles and 152 mm self-propelled artillery. Officials from the self-proclaimed Luhansk People's Republic recorded four Ukrainian violations of the truce within the republic boundaries. The Ukrainian miliitary used heavy machine guns, 73 mm antitank recoilless rifles, 82 mm and 120 mm mortars to attack pro-Russian forces at Lohvynove, Lozove, Zholobok and Donetskyi. The press-centre of the JFO reported in the evening that pro-Russian military had opened fire on positions of Ukrainian troops on 3 occasions, the fire was returned on all occasions. Two Ukrainian servicemen were killed and two others were injured by landmine explosion near Svitlodarsk. By the end of the day a total of 10 ceasefire violations were registered. in the area of Donetsk city and in the region of Mariupol, Ukrainian forces at Hnutove, Pisky, Taramchuk and Marinka became the target of infantry weapons and rocket launchers. In the northern section of the demarcation line, Novoluhanske under 82 mm and 120 mm mortar fire. Ukrainian positions at Novotoshkivke, meanwhile, were attacked with small arms, grenade launchers and 82 mm mortars. Ukrainian troops at Zolote were harassed with small arms fire and antitank rockets. The spokesman of the Ukrainian operational headquarters reported in the morning, that pro-Russian troops had opened fire on 10 occasions on Ukrainian positions the previous day (including on 7 occasions in Donetsk region and on 3 occasions in Luhansk region); the fire was returned on 7 occasions. By noon of 11 November one ceasefire violation was registered with no casualties on the Ukrainian side, the fire was returned. The spokesman of the Ministry of Defence reported at noon that two Ukrainian servicemen (born in 1974 and in 1976) were killed and two others were injured in the Donbass region on 10 November. Pro-Russian authorities at Donetsk city reported 11 Ukrainian violations of the ceasefire in nine locations using small arms, heavy machine guns, automatic grenade launchers, 73 mm antitank recoilless rifles, 82 mm and 120 mm mortars. According to local sources, the Ukrainian military broke the ceasefire twice within the borders of the self-styled Luhansk People's Republic. The Ukrainian military employed 82 mm mortars and BMP-1 armoured vehicles to engage pro-Russian positions at Zolote and Zholobok. According to the information provided by the press-centre of the JFO in the evening, pro-Russian military had opened fire on positions of Ukrainian troops on 3 occasions. By the end of the day total 7 ceasefire violations were registered with no casualties on the Ukrainian side. Separatist forces employed infantry weapons and grenade launchers to harass Ukrainian troops at Vodiane and Taramchuk, in the outskirts of Donetsk city and in the region of Mariupol, and Luhanske, Novotoshkivke, Orekhove and Zolote, in the northern sector of the demarcation line. A number of ceasefire violations carried out by Ukrainian forces were reported by pro-Russian officials at Donetsk city. Yasynuvata, Spartak and Kruta Balka, in the environs of Donetsk city, Dolomitne and Zaitseve, in the area of Horlivka, and Uzhivka, in the region of Mariupol, came under hostile fire. In the main incidents, BMP-1 armoured vehicles from Vodiane launched a sustained attack on pro-Russian positions at Uzhivka. Spartak came under 82 mm and 120 mm mortar fire. Dolomitne received fire from a BMP-1 armoured vehicle and 82 mm mortars from Travneve. Zaitseve was fired at by 73 mm antitank recoilless rifles and 82 mm mortars. Two civilian residences were set on fire at Zaitseve and Dolomitne. Legislative elections were held in both separatist republics. In the case of the DNR, voters elected the successor of Denis Pushilin, who replaced Aleksander Zakharchenko after his assassination in late August. Western governments called the move a "sham election", and urged Russia to use its influence to call off the polls. According to the information provided by the spokesman of the Ukrainian operational headquarters in the morning, pro-Russian troops had opened fire on 7 occasions on Ukrainian positions the previous day (including on 3 occasions in Donetsk region and on 4 occasions in Luhansk region); the fire was returned on all occasions. By noon of 12 November one ceasefire violation was registered (near Staryi Aidar, at around 1:00 am), with no casualties on the Ukrainian side. The spokesman of the Ministry of Defence reported at noon no casualties in the Donbass region on 11 November. Pro-Russian authorities at Donetsk city reported seven Ukrainian violations of the ceasefire in five different locations using small arms, heavy machine guns, grenade launchers, 73 mm antitank recoilless rifles, 82 mm mortars, 120 mm mortars, armoured personnel carriers and armoured fighting vehicles. Local sources from the self-proclaimed Luhansk People's Republic recorded two Ukrainian violations of the truce within the republic boundaries. Ukrainian forces used automatic grenade launchers, antitank rockets launchers and 120 mm mortars to attack pro-Russian positions at Zholobok and Lozove. The press-centre of the JFO reported in the evening that pro-Russian military had opened fire on positions of Ukrainian troops on 4 occasions. By the end of the day total 9 ceasefire violations were registered – at Staryi Aidar, Vilnyi, Troitske, and Verkhnyotoretske, in the northern sector of the demarcation line, and Krasnohorivka, Stepne, Vodiane and Berezove, in the surroundings of Donetsk and Mariupol. Besides grenade launchers of different systems, heavy machine guns, and small arms at Troistke and Vilnyi 82 mm mortars were employed too. One Ukrainian soldier sustained minor injuries as a result. A series of ceasefire violations were reported by pro-Russian officials at Donetsk city; Spartak, Trudivske and Staromykhailivka, in the outskirts of Donetsk city, Zaitseve, in the area of Horlivka, and, in the region of Mariupol, Sakhanka, Pikuzy and Uzhivka, came under attack. Most incidents involved the use of infantry weapons and automatic grenade launchers. Spartak became the target of 82 mm mortars. The Ministry of Defence reported total 83 ceasefire violations during last week (from 5 to 11 November), as a result two Ukrainian servicemen were killed and ten others were wounded. The spokesman of the Ukrainian operational headquarters reported in the morning, that pro-Russian troops had opened fire on 9 occasions on Ukrainian positions the previous day (including on 5 occasions in Donetsk and on 4 occasions in Luhansk region); the fire was returned on 7 occasions. By noon of 13 November three ceasefire violations were was registered with no casualties on the Ukrainian side; the fire was returned on all occasions. The spokesman of the Ministry of Defence confirmed at noon that one Ukrainian serviceman was wounded in action in the Donbass region on 12 November. Pro-Russian sources at Donetsk city recorded 11 Ukrainian violations of the ceasefire in six locations using small arms, heavy machine guns, automatic grenade launchers and 73 mm antitank recoilless rifles. Officials from the self-proclaimed Luhansk People's Republic recorded one Ukrainian violation of the truce within the republic boundaries, when BMP-1 armoured vehicles from Troitske launched an intense attack on pro-Russian positions at Kalynove. According to the information provided by the press-centre of the JFO in the evening at 6:00 pm, pro-Russian military had opened fire on positions of Ukrainian troops on 4 occasions. By the end of the day total 8 ceasefire violations were registered with no casualties on the Ukrainian side. In the outskirts of Donetsk city and in the region of Mariupol, pro-Russian armoured fighting vehicles engaged Ukrainian redoubts at Chermalyk. Small arms, heavy machine guns and antitank rocket launchers were fired at Ukrainian positions around Krasnohorivka, Vodiane, Hnutove and Pavlopil. In the northern section of the demarcation line, 82 mm mortar rounds landed in Krymske. A number of Ukrainian violations of the ceasefire were recorded by pro-Russian authorities at Donetsk city by evening. Yasynuvata, Trudivske and Spartak, in the surroundings of Donetsk city, Zaitseve and Gagarin mining complex, in the area of Horlivka, and, in the region of Mariupol, Pikuzy, came under hostile fire. The majority of the incidents involved the use of infantry weapons, automatic grenade launchers, antitank rocket launchers and 73 mm antitank recoilless rifles. Early in the morning, Spartak was hit by a combination of antitank rockets and 82 mm mortar rounds. According to the information provided by the spokesman of the Ukrainian operational headquarters in the morning, pro-Russian troops had opened fire on 8 occasions on Ukrainian positions the previous day (including on 6 occasions in Donetsk region and twice in Luhansk region); the fire was returned on 6 occasions. By noon of 14 November three ceasefire violations were registered – near Krasnohorivka (at around 3:00 am), Krymske (at around 6:30 am), and Staryi Aidar (at around 8:00 am) – with no casualties on the Ukrainian side. The spokesman of the Ministry of Defence reported at noon no casualties in the Donbass region on 13 November. Pro-Russian authorities at Donetsk city reported 17 Ukrainian violations of the ceasefire in seven locations using small arms, heavy machine guns, automatic grenade launchers, 73 mm antitank recoilless rifles and 82 mm mortars. In the self-proclaimed Luhansk People's Republic, local sources said that Ukrainian forces from Krymske harassed pro-Russian troops at Zholobok using small arms, automatic grenade launchers and antitank rocket launchers. The press-centre of the JFO reported in the evening that pro-Russian military had opened fire on positions of Ukrainian troops on 11 occasions. By the end of the day total 16 ceasefire violations were registered, as a result, one Ukrainian soldier was wounded. In the outskirts of Donetsk city and in the region of Mariupol, Krasnohorivka, Novoselivka, Hranitne, Hnutove, Lebedinskoe, Pisky, Pavlopil and Verkhnyotoretske became the target of small arms, heavy machine guns and rocket launchers. In the northern sector of the demarcation line, pro-Russian armoured fighting vehicles engaged Ukrainian positions at Krymske, Vilnyi, Stary Aidar and Shchastya supported by 82 mm mortar fire, antitank rockets and, in the area of Vilnyi, ZU-23-2 antiaircraft guns. Pro-Russian sources from Donetsk city told the press that Ukrainian forces had broken the ceasefire on several occasions by evening. Trudivske, Yasynuvata, Kruta Balka, Vasylivka, Staromykhailivka and Mineralne, in the environs of Donetsk city, Zaitseve, Shyroka Balka and Holmivsky, in the area of Horlivka, and, in the region of Mariupol, Uzhivka and Pikuzy, came under hostile fire. In the main incidents, heavy shelling was reported at Shyroka Balka, where pro-Russian positions were hit by 82 mm mortar barrages. BMP-2 armoured vehicles from Kamianka and Travneve raked pro-Russian redoubts at Vasylivka and Holmivsky with 30 mm gunfire. ZU-23-2 antiaircraft guns were fired at pro-Russian troops near Yasynuvata, where a train hangar was damaged. The spokesman of the Ukrainian operational headquarters reported in the morning, that pro-Russian troops had opened fire on 16 occasions on Ukrainian positions the previous day (including on 11 occasions in Donetsk region and on 5 occasions in Luhansk region); the fire was returned on 9 occasions. By noon of 15 November four ceasefire violations were registered with no casualties on the Ukrainian side; the fire was returned on all occasions. The spokesman of the Ministry of Defence confirmed at noon that one Ukrainian serviceman was wounded in the Donbass region on 14 November. Pro-Russian officials at Donetsk city recorded 19 Ukrainian violations of the ceasefire in 14 different locations employing small arms, heavy machine guns, automatic grenade launchers, 73 mm antitank recoilless rifles, antiaircraft artillery, 82 mm mortars, armoured personnel carriers and armoured fighting vehicles. Authorities from the self-proclaimed Luhansk People's Republic recorded four Ukrainian violations of the truce within the republic boundaries. Ukrainian forces used heavy machine guns, automatic grenade launchers, 82 mm mortars and BMP-1 armoured vehicles to engage pro-Russian forces at Mariivka and Pervomaisk. According to the information provided by the press-centre of the JFO in the evening, pro-Russian military had opened fire on positions of Ukrainian troops on 8 occasions, one Ukrainian soldier was wounded as a result. By the end of the day total 16 ceasefire violations were registered, another Ukrainian serviceman was wounded. In the area of Donetsk and in the region of Mariupol, Avdiivka, Pisky, Slavne, Marinka, Shyrokyne, Pavlopil and Vodiane became the target of infantry weapons and grenade launchers. Vodiane was hit by 82 mm and 120 mm mortar rounds. In the northern section of the demarcation line, pro-Russian BMP-1 armoured vehicles attacked Vilnyi supported by 82 mm mortar fire, while 120 mm mortars were fired at Shumy. Yuzhne and Shumy were also hit by 82 mm mortar rounds. Ukrainian troops at Malynove and Stanytsia Luhanska were harassed with small arms fire. A series of Ukrainian violations of the ceasefire were reported by pro-Russian sources at Donetsk city. Ukrainian forces attacked Spartak, Oleksandrivka and Trudivske, in the area of Donetsk city, Holmivsky and Dolomitne, in the outskirts of Horlivka, and, in the region of Mariupol, Pikuzy and Sakhanka. In the main incidents, a single 120 mm mortar round landed in Holmivsky, while 82 mm mortar barrages hit Pikuzy. BMP-2 armoured vehicles opened fire on Dolomitne. A number of civilian residences were damaged. A teenager girl was wounded at Holmivsky. According to the information provided by the spokesman of the Ukrainian operational headquarters in the morning, pro-Russian troops had opened fire on 16 occasions on Ukrainian positions the previous day (including on 10 occasions in Donetsk and on 6 occasions in Luhansk region); the fire was returned on several occasions. By morning of 16 November (as of 11:00 am) no ceasefire violations were registered. The spokesman of the Ministry of Defence confirmed at noon that two Ukrainian servicemen were wounded in the Donbass region on 15 November. Pro-Russian authorities at Donetsk city recorded 14 Ukrainian violations of the ceasefire in six locations using small arms, heavy machine guns, automatic grenade launchers, 73 mm antitank recoilless rifles, 82 mm and 120 mm mortars. The same sources reported that the Ukrainian military broke the ceasefire 90 times over the past week, firing 122 mm self-propelled artillery, armoured fighting vehicles, and 67 rounds from 120 mm and 82 mm mortars. One civilian resident was wounded. Officials from the self-proclaimed Luhansk People's Republic recorded three Ukrainian violations of the truce within the republic boundaries. The Ukrainian miliitary shelled Mariivka with 120 mm mortars, while BMP-1 armoured vehicles from Troitske launched two attacks on pro-Russian positions at Kalynove. The press-centre of the JFO reported in the evening, that pro-Russian military had opened fire on positions of Ukrainian troops on 5 occasions. By the end of the day total 10 ceasefire violations were registered with no casualties on the Ukrainian side. Pro-Russian sources from Donetsk city told the press that Ukrainian forces had broken the ceasefire on several occasions by evening. Trudivske, Spartak, Oleksandrivka, Mineralne and Kruta Balka, in the outskirts of Donetsk city, Gagarin mining complex, in the area of Horlivka, and, in the region of Mariupol, Sakhanka and Pikuzy, came under hostile fire. Most incidents involved the use of infantry weapons and automatic grenade launchers. Trudivske, Mineralne, Kruta Balka, Spartak and Pikuzy became the target of 73 mm antitank recoilless rifles. The spokesman of the Ukrainian operational headquarters reported in the morning, that pro-Russian troops had opened fire on 10 occasions on Ukrainian positions the previous day (including on 6 occasions in Donetsk region and on 4 occasions in Luhansk region); the fire was returned on several occasions. By noon of 17 November three ceasefire violations were registered, one Ukrainian serviceman (born in 1981) was killed in action. The spokesman of the Ministry of Defence reported at noon no casualties in the Donbass region on 16 November. Pro-Russian authorities at Donetsk city reported 15 Ukrainian violations of the ceasefire in ten locations using small arms, heavy machine guns, automatic grenade launchers and 73 mm antitank recoilless rifles. Officials from the self-proclaimed Luhansk People's Republic recorded two Ukrainian violations of the truce within the republic boundaries. The Ukrainian military used small arms, heavy machine guns, 82 mm mortars and BMP-1 armoured vehicles to engage pro-Russian positions at Sentianivka and Zolote. According to the information provided by the press-centre of the JFO in the evening, pro-Russian military had opened fire on positions of Ukrainian troops on 7 occasions. By the end of the day total 16 ceasefire violations were registered. Pro-Russian sources at Donetsk city told the press that Ukrainian forces had broken the ceasefire on several occasions by evening. Spartak, Trudivske, Kruta Balka, Kashtanove, Vasiilivka, Oleksandrivka and Mineralne, in the environs of Donetsk city, Dolomitne, Zaitseve, Holmivsky, Ozeryanivka and Gagarin mining complex, in the area of Horlivka, and Novolaspa, in the region of Mariupol, came under hostile fire. In the main incidents, BMP-1 armoured vehicles from Marinka engaged pro-Russian redoubts at Oleksandrivka. BMP-2 armoured vehicles from Novoluhanske, Starohnativka and Avdiivka fired 30 mm cannon rounds at pro-Russian positions around Dolomitne, Novolaspa and Spartak, respectively. Holmivsky, Vasiilivka and Mineralne became the target of ZU-23-2 antiaircraft guns. According to the information provided by the spokesman of the Ukrainian operational headquarters in the morning, pro-Russian troops had opened fire on 16 occasions on Ukrainian positions the previous day (including on 9 occasions in Donetsk region and on 7 occasions in Luhansk region); the fire was returned on several occasions. By noon of 18 November two ceasefire violations were registered, with no casualties on the Ukrainian side; the fire was returned on both occasions. The spokesman of the Ministry of Defence confirmed at noon that one Ukrainian serviceman was killed in the Donbass region on 17 November. Pro-Russian officials at Donetsk city recorded 18 Ukrainian violations of the ceasefire in 15 different locations employing small arms, heavy machine guns, automatic grenade launchers, 73 mm antitank recoilless rifles, antiaircraft artillery, 120 mm mortars, armoured personnel carriers and armoured fighting vehicles. Authorities from the self-proclaimed Luhansk People's Republic recorded five Ukrainian violations of the truce within the republic boundaries. The Ukrainian military used small arms, heavy machine guns, snipers, antitank rocket launchers, 73 mm antitank rocket launchers, 82 mm mortars, 120 mm mortars, antiaircraft guns and BMP-1 armoured vehicles to attack pro-Russian forces at Zholobok, Sentianivka and Pankivka. The press-centre of the JFO reported in the evening, that pro-Russian military had opened fire on positions of Ukrainian troops on 8 occasions. By the end of the day total 16 ceasefire violations were registered with no casualties on the Ukrainian side. A number of Ukrainian violations of the ceasefire were recorded by pro-Russian sources at Donetsk city by evening. Trudivske, Spartak, Kruta Balka, Yasynuvata, Staromykhailivka and Oleksandrivka, in the outskirts of donetsk city, Gagarin mining complex, in the area of Horlivka, and, in the region of Mariupol, Pikuzy and Sakhanka, came under attack. Most incidents involved the use of infantry weapons and automatic grenade launchers. Spartak received fire from 73 mm antitank recoilless rifles. The spokesman of the Ukrainian operational headquarters reported in the morning, that pro-Russian troops had opened fire on 16 occasions on Ukrainian positions the previous day (including on 11 occasions in Donetsk region and on 5 occasions in Luhansk region); the fire was returned on 13 occasions. By noon of 19 November three ceasefire violations were registered, two Ukrainian soldiers were wounded as a result. The spokesman of the Ministry of Defence reported at noon no casualties in the Donbass region on 18 November. Pro-Russian officials at Donetsk city reported 15 Ukrainian violations of the ceasefire in ten locations using small arms, heavy machine guns, snipers, automatic grenade launchers and 73 mm antitank recoilless rifles. Sources from the self-proclaimed Luhansk People's Republic recorded four Ukrainian violations of the ceasefire within the republic boundaries. The Ukrainian military used small arms, heavy machine guns, snipers, automatic grenade launchers, 73 mm antitank rocket launchers, 82 mm mortars, 120 mm mortars and BMP-1 armoured vehicles to attack pro-Russian forces at Zholobok, Lohvynove, Kalynove and Lozove. According to the information provided by the press-centre of the JFO in the evening, pro-Russian military had opened fire on positions of Ukrainian troops on 10 occasions. By the end of the day total 21 ceasefire violations were registered, one more Ukrainian serviceman was wounded. An Orlan-10 Russian-made drone was shot down by a Ukrainian Air Force defense unit while "collecting intelligence information along the Bakhmut-Kostiantynivka-Ocheretyne route", Ukrainian JFO sources said. The shot down Orlan was one of thirteen reconnaissance flights of the UAVs recorded in a week. According to pro-Russian authorities from Donetsk city, there were several Ukrainian violations of the ceasefire throughout the day. Kruta Balka, Yakovliivka, Dokuchaievsk and Yasynuvata, in the surroundings of Donetsk city, Gagarin mining complex, Zaitseve and Holmivsky, in the area of Horlivka, and, in the region of Mariupol, Sakhanka, came under hostile fire. The majority of incidents involved the use of infantry weapons and grenade launchers. 73 mm antitank recoilless rifles were fired at Yasynuvata and Holmivsky. The Ministry of Defence reported total 91 ceasefire violations during last week (from 12 to 18 November), as a result, one Ukrainian serviceman was killed and four others were wounded in action. According to the information provided by the spokesman of the Ukrainian operational headquarters in the morning, pro-Russian troops had opened fire on 21 occasions on Ukrainian positions the previous day (including on 13 occasions in Donetsk region and on 8 occasions in Luhansk region); the fire was returned on 12 occasions. By noon of 20 November no ceasefire violations were registered by the Ukrainian side. The spokesman of the Ministry of Defence confirmed at noon that three Ukrainian servicemen were wounded in the Donbass region on 19 November. Pro-Russian authorities at Donetsk city reported 16 Ukrainian violations of the ceasefire in ten locations using small arms, heavy machine guns, automatic grenade launchers and 73 mm antitank recoilless rifles. Authorities from the self-proclaimed Luhansk People's Republic recorded five Ukrainian violations of the truce within the republic boundaries. Ukrainian forces used small arms, automatic grenade launchers, 73 mm antitank recoilless rifles, 82 mm mortars, 120 mm mortars, BMP-1 armoured vehicles and 122 mm self-propelled artillery to engage pro-Russian forces at Zholobok, Kalynivka and Zolote. The press-centre of the JFO reported in the evening pro-Russian military activities in the area of Pisky. By the end of the day total 6 ceasefire violations were registered with no casualties on the Ukrainian side. Pro-Russian sources from Donetsk city told the press that Ukrainian forces had broken the ceasefire on several occasions by evening. Ukrainian forces attacked Yasynuvata, Kruta Balka and Spartak, in the outskirts of Donetsk city, and, in the area of Horlivka, Holmivsky and Zaitseve. Most incidents involved the use of infaantry weapons, grenade launchers and 73 mm antitank recoilless rifles. ZU-23-2 antiaircraft guns were fired at Kruta Balka, and a single 82 mm mortar round landed in Holmivsky. The spokesman of the Ukrainian operational headquarters reported in the morning, that pro-Russian troops had opened fire on 6 occasions on Ukrainian positions the previous day (including on 5 occasions in Donetsk region and once in Luhansk region); the fire was returned twice. By morning of 21 November (as of 11:00 am) one ceasefire violation was registered with no casualties on the Ukrainian side; the fire was not returned. The spokesman of the Ministry of Defence reported at noon no casualties in the Donbass region on 20 November. Pro-Russian officials at Donetsk city recorded 11 Ukrainian violations of the ceasefire in eight different locations employing small arms, heavy machine guns, automatic grenade launchers, 73 mm antitank recoilless rifles, 82 mm mortars and antiaircraft artillery. Authorities from the self-proclaimed Luhansk People's Republic recorded four Ukrainian violations of the truce within the republic boundaries. Ukrainian forces used heavy machine guns, automatic grenade launchers, 82 mm mortars, BMP-1 armoured vehicles, a tank and 122 mm self-propelled artillery to engage pro-Russian forces at Zholobok, Sentianivka, Donetskyi and Mariivka. According to the information provided by the press-centre of the JFO in the evening, pro-Russian military had opened fire on positions of Ukrainian troops on 5 occasions. By the end of the day total 11 ceasefire violations were registered, one Ukrainian serviceman suffered minor injuries as a result. A series of Ukrainian violations of the ceasefire were recorded by pro-Russian sources at Donetsk city. Yasynuvata, Trudivske, Spartak, Donetsk airport, Olenivka, Kruta Balka and Volvo Center, in the outskirts of Donetsk city, and, in the region of Mariupol, Uzhivka, Novoshyrokivske and Pikuzy, came under attack. The majority of the incidents involved the use of infantry weapons, and automatic grenade launchers. Yasynuvata was hit by 120 mm mortar rounds, and 82 mm mortars were fired at Spartak. Donetsk airport was shelled with 73 mm antitank recoilless rifles. According to the information provided by the spokesman of the Ukrainian operational headquarters in the morning, pro-Russian troops had opened fire on 11 occasions on Ukrainian positions the previous day (including on 6 occasions in Donetsk region and on 5 occasions in Luhansk region); the fire was returned on 9 occasions. By noon of 22 November one ceasefire violation was registered with no casualties on the Ukrainian side. The spokesman of the Ministry of Defence confirmed at noon that one Ukrainian serviceman was wounded in the Donbass region on 21 November. Pro-Russian authorities at Donetsk city reported 17 Ukrainian violations of the ceasefire in 12 locations using small arms, heavy machine guns, automatic grenade launchers, 73 mm antitank recoilless rifles, 82 mm and 120 mm mortars. Local sources said that the Ukrainian military broke the ceasefire once, when Ukrainian troops fired small arms and heavy machine guns at pro-Russian positions near Kalynove. The press-centre of the JFO reported in the evening, that pro-Russian military had opened fire on positions of Ukrainian troops on 2 occasions. By the end of the day total 4 ceasefire violations were registered with no casualties on the Ukrainian side. Pro-Russian officials at Donetsk city reported several Ukrainian violations of the ceasefire by evening. Ukrainian forces attacked Yasynuvata, Spartak, Kruta Balka and Donetsk airport, in the environs of Donetsk city, Holmivsky, Gagarin mining complex and Zaitseve, in the area of Horlivka, and Sakhanka, in the region of Mariupol. In the main incidents, 82 mm mortar rounds hit Donetsk airport, while BMP-2 armoured vehicles from Butivka engaged pro-Russian troops at Spartak, supported by 120 mm mortar fire. Holmivsky received fire from ZU-23-2 antiaircraft guns. The spokesman of the Ukrainian operational headquarters reported in the morning, that pro-Russian troops had opened fire on 4 occasions on Ukrainian positions the previous day (including once in Donetsk region and on 3 occasions in Luhansk region); the fire was returned twice. By morning of 23 November three ceasefire violations were was registered with no casualties on the Ukrainian side. The spokesman of the Ministry of Defence reported at noon no casualties in the Donbass region on 22 November. Pro-Russian officials at Donetsk city recorded 19 Ukrainian violations of the ceasefire in ten different locations employing small arms, heavy machine guns, automatic grenade launchers, 73 mm antitank recoilless rifles, antiaircraft artillery, 82 mm mortars, 120 mm mortars, armoured personnel carriers and armoured fighting vehicles. Officials from the self-proclaimed Luhansk People's Republic reported that Ukrainian forces broke the ceasefire two times within the republic boundaries. The Ukrainian military employed small arms, heavy machine guns, 82 mm mortars and BMP-1 armoured fighting vehicles to engage pro-Russian troops at Zolote and Nyzhnyi Lozove. According to the information provided by the press-centre of the JFO in the evening, pro-Russian military had opened fire on positions of Ukrainian troops on 7 occasions, as a result, two Ukrainian servicemen were wounded. By the end of the day total 11 ceasefire violations were registered. A series of Ukrainian violations of the ceasefire were recorded by pro-Russian sources at Donetsk city by evening. Spartak, Kashtanove, Kruta Balka, Staromykhailivka, Oleksandrivka, Vasiilivka and Yasynuvata, in the surroundings of Donetsk city, in the area of Horlivka Gagarin mining complex, Izotove and Dolomitne, and Sakhanka, in the region of Mariupol, . In the main incidents, Spartak became the target of 120 mm mortar fire, while BMP-1 armoured vehicles from Shyrokyne attacked Sakhanka. BMP-2 armoured vehicles from Shumy opened fire on Ukrainian positions at Gagarin mining complex. Kruta Balka was fired at from ZU-23-2 antiaircraft guns. According to the information provided by the spokesman of the Ukrainian operational headquarters in the morning, pro-Russian troops had opened fire on 11 occasions on Ukrainian positions the previous day (including on 5 occasions in Donetsk and on 6 occasions in Luhansk region); the fire was returned on 7 occasions. By noon of 24 November two ceasefire violations were registered – near Krymske (at around 4:30 am), and Novoluhanske (at around 10:00 am) – with no casualties on the Ukrainian side. The spokesman of the Ministry of Defence confirmed at noon two Ukrainian servicemen were wounded in the Donbass region on 23 November. Pro-Russian authorities at Donetsk city reported 21 Ukrainian violations of the ceasefire in 16 locations using small arms, heavy machine guns, automatic grenade launchers, 73 mm antitank recoilless rifles, antiaircraft guns, armoured personnel carriers and armoured fighting vehicles. Officials from the self-proclaimed Luhansk People's Republic recorded four Ukrainian violations of the truce within the republic boundaries. Ukrainian forces employed heavy machine guns, automatic grenade launchers, 73 mm antitank recoilless rifles, 82 mm mortars, 120 mm mortars and BMP-1 armoured vehicles to engage pro-Russian forces at Zholobok, Mykhailivka, Kalynove and Mariivka. The press-centre of the JFO reported in the evening, that pro-Russian military had opened fire on positions of Ukrainian troops on 4 occasions. By the end of the day total 7 ceasefire violations were registered, as a result, one Ukrainian serviceman was lethally wounded. Pro-Russian sources told the press that Ukrainian forces had broken the ceasefire on several occasions by evening. Yasynuvata, Spartak, Kruta Balka, Lozove, Trudivske and Oleksandrivka, in the outskirts of Donetsk city, Dolomitne, Gagarin mining complex, Zaitseve and Holmivsky, in the area of Horlivka, and, in the region of Mariupol, Uzhivka, Sakhanka and Novoshyrokyvske, came under hostile fire. In the main incidents, Sakhanka was hit by 82 mm mortar fire. BMP-1 armoured vehicles from Vodiane and Travneve opened fire on Uzhivka and Holmivsky, respectively. The spokesman of the Ukrainian operational headquarters reported in the morning, that pro-Russian troops had opened fire on 7 occasions on Ukrainian positions the previous day (including on 2 occasions in Donetsk region and on 5 occasions in Luhansk region); the fire was returned on 6 occasions. By morning of 25 November (as of 11:00 am) five ceasefire violations were was registered; the fire was returned twice. The spokesman of the Ministry of Defence reported confirmed at noon that one Ukrainian serviceman was lethally wounded in the Donbass region on 24 November. Pro-Russian authorities at Donetsk city reported 18 Ukrainian violations of the ceasefire in 13 locations using small arms, heavy machine guns, automatic grenade launchers, 73 mm antitank recoilless rifles, 82 mm mortars, armoured personnel carriers and armoured fighting vehicles. Officials from the self-proclaimed Luhansk People's Republic recorded five Ukrainian violations of the truce within the republic boundaries. Ukrainian forces used small arms, automatic grenade launchers, 73 mm antitank recoilless rifles, 82 mm mortars, 120 mm mortars, BMP-1 armoured vehicles to attack separatist positions at Zholobok, Kalynivka and Zolote. According to the information provided by the press-centre of the JFO in the evening, pro-Russian military had opened fire on positions of Ukrainian troops on 9 occasions, two Ukrainian servicemen were wounded as a result. By the end of the day total 16 ceasefire violations were registered. A number of Ukrainian attacks on pro-Russian positions were reported by separatists sources at Donetsk city by evening. Yakovliivka, Krasnyi Patizan, Staromykhailivka, Yasynuvata, Vasiilivka and Donetsk airport, in the area of Horlivka, Zaitseve and Gagarin mining complex, and Sakhanka, in the region of Mariupol, came under fire. In the main incidents, Sakhanka was hit by 120 mm mortar rounds, while Yakovliivka, Zaitseve and Donetsk airport were shelled from 73 mm antitank recoilless rifles. One civilian resident was wounded in Panteleymonivka. Three Ukrainian Navy vessels were harassed in the Kerch Strait on their way from Odessa to Mariupol. The three ships were the Gyurza-M class gunboats Berdyansk and Nikopol, and the tug Yany Kapa. All of them were eventually seized by Russian patrol vessels. The tug was previously rammed and damaged, while one of the gunboats was hit by naval gunfire. At least three Ukrainian seamen were wounded in the action. According to the information provided by the spokesman of the Ukrainian operational headquarters in the morning, pro-Russian troops had opened fire on 11 occasions on Ukrainian positions the previous day (including on 8 occasions in Donetsk region and on 8 occasions in Luhansk region); the fire was returned on several occasions. By noon of 26 November three ceasefire violations were registered, as a result, two Ukrainian servicemen were wounded. The spokesman of the Ministry of Defence confirmed at noon that two Ukrainian servicemen were wounded in the Donbass region on 25 November. Pro-Russian sources at Donetsk city reported 17 Ukrainian violations of the ceasefire in seven locations using small arms, heavy machine guns, automatic grenade launchers, 73 mm antitank recoilless rifles, 82 mm and 120 mm mortars. Authorities from the self-proclaimed Luhansk People's Republic recorded four Ukrainian violations of the truce within the republic boundaries. Ukrainian forces used heavy machine guns, automatic grenade launchers, 73 mm antitank recoilless rifles, 82 mm and 120 mm mortars, BMP-1 armoured vehicles to engage pro-Russian forces at Kalynove, Krasnyi Yar, Sokilnyky and Mariivka. The press-centre of the JFO reported in the evening, that pro-Russian military had opened fire on positions of Ukrainian troops on 6 occasions. By the end of the day total 18 ceasefire violations were registered. Pro-Russian officials from Donetsk city recorded a series of Ukrainian violations of the truce by evening. The Ukrainian military opened fire on pro-Russian positions at Volvo Center, Yasynuvata, Kruta Balka, Staromykhailivka and Kashtanove, in the environs of Donetsk city, Mykhailivka, Izotove, Zaitseve, Holmivsky, Gagarin mining complex, in the area of Horlivka, and, in the region of Mariupol, Sakhanka and Uzhivka. In the main incidents, Uzhivka was struck by 82 mm and 120 mm mortar volleys. Staromykhailivka and Volvo Center received 120 mm mortar fire, while 82 mm mortar rounds hit Sakhanka, Holmivsky and Ozeryanivka. BMP-2 armoured vehicles from Shumy, Pisky and Avdiivka engaged pro-Russian forces at Izotove, Volvo Center and Yasynuvata, respectively. BMP-2 armoured vehicles also opened fire on Ukrainian positions at Volvo Center, Uzhivka and Ozeryanivka. ZU-23-2 antiaircraft guns were fired at Kruta Balka and Kashtanove. A Ukrainian drone loaded with incendiary ordnance was shot down by pro-Russian forces over Dolomitne. The spokesman of the Ukrainian operational headquarters reported in the morning, that pro-Russian troops had opened fire on 18 occasions on Ukrainian positions the previous day (including on 11 occasions in Donetsk region and on 7 occasions in Luhansk region; employing heavy artillery on 7 occasions); the fire was returned on 10 occasions. No ceasefire violations were registered by morning of 27 November. The spokesman of the Ministry of Defence confirmed at noon that two Ukrainian servicemen had suffered minor injuries in action in the Donbass region on 26 November. Pro-Russian officials at Donetsk city recorded 18 Ukrainian violations of the ceasefire in 14 different locations employing small arms, heavy machine guns, automatic grenade launchers, 73 mm antitank recoilless rifles, antiaircraft artillery, 82 mm mortars, 120 mm mortars, armoured personnel carriers and armoured fighting vehicles. Sources from the self-proclaimed Luhansk People's Republic recorded eight Ukrainian violations of the truce within the republic boundaries. The Ukrainian military used small arms, heavy machine guns, automatic grenade launchers, 82 mm mortars, 120 mm mortars and BMP-1 armoured vehicles to attack pro-Russian redoubts at Sokilnyky, Krasnyi Yar, Kalynivka, Molodezhne and Knyaz Igor memorial. According to the information provided by the press-centre of the JFO in the evening, pro-Russian military had targeted positions of Ukrainian troops at Krymske, employing grenade launchers, heavy machine guns, and small arms. By the end of the day total 5 ceasefire violations were registered, with no casualties on the Ukrainian side. According to pro-Russian authorities from Donetsk city, Ukrainian forces had broken the ceasefire on several occasions by evening. Zhabicheve, Spartak, Kruta Balka, Yasynuvata, Trudivske and Staromykhailivka, in the outskirts of Donetsk city, Gagarin mining complex and Zaitseve, in the area of Horlivka, and, in the region of Mariupol, Novoshyrokivske, Uzhivka, Sakhanka and Pikuzy, came under attack. In the main incidents, BMP-1 armoured vehicles from Avdiivka engaged pro-Russian positions at Spartak, while BMP-2 armoured vehicles from Shyrokyne raked pro-Russian positions at Sakhanka with 30 mm gunfire. 73 mm antitank recoilless rifles opened fire on Zhabicheve, Uzhivka, Spartak, Trudivske and Gagarin. According to the information provided by the spokesman of the Ukrainian operational headquarters in the morning, pro-Russian troops had opened fire on 5 occasions on Ukrainian positions the previous day (including on 2 occasions in Donetsk region and on 3 occasions in Luhansk region); the fire was returned on several occasions. By noon of 28 November one ceasefire violation was registered, with no casualties on the Ukrainian side. The spokesman of the Ministry of Defence reported at noon no casualties in the Donbass region on 27 November. Martial law, effective till 27 December, was introduced in several regions, including in Donetsk and Luhansk region, the report reads. Pro-Russian authorities at Donetsk city reported 21 Ukrainian violations of the ceasefire in 14 locations using small arms, heavy machine guns, automatic grenade launchers, 73 mm antitank recoilless rifles, armoured personnel carriers and armoured fighting vehicles. No Ukrainian violations of the ceasefire were reported within the borders of the self-proclaimed Luhansk People's Republic. The press-centre of the JFO reported in the evening that from 7:00 am to 6:00 pm pro-Russian military had opened fire on positions of Ukrainian troops on 2 occasions, two Ukrainian servicemen were wounded as a result. By the end of the day total 14 ceasefire violations were registered. Pro-Russian authorities from Donetsk city recorded a number of Ukrainian violations of the ceasefire by evening. Spartak, Volvo Center, Yasynuvata and Kruta Balka, in the outskirts of Donetsk city, Gagarin mining complex, Zaitseve and Dolomitne, in the area of Horlivka, and, in the region of Mariupol, Sakhanka and Pikuzy, were attacked by Ukrainian forces. Most incidents involved the use of infantry weapons and automatic grenade launchers. BMP-2 armoured vehicles from Avdiivka and Marinka engaged pro-Russian positions at Spartak and Trudivske respectively. Dolomitne, Zaitseve, Spartak and Pikuzy became the target of 73 mm antitank recoilless rifles. The spokesman of the Ukrainian operational headquarters reported in the morning, that pro-Russian troops had opened fire on 14 occasions on Ukrainian positions the previous day (including on 8 occasions in Donetsk region and on 6 occasions in Luhansk region); the fire was returned on several occasions. By noon of 29 November two ceasefire violations were registered with no casualties on the Ukrainian side. The spokesman of the Ministry of Defence confirmed at noon that two Ukrainian servicemen were wounded in the Donbass region on 28 November. Pro-Russian authorities at Donetsk city recorded 19 Ukrainian violations of the ceasefire in 12 different locations employing small arms, heavy machine guns, automatic grenade launchers, 73 mm antitank recoilless rifles, armoured personnel carriers and armoured fighting vehicles. Officials from the self-proclaimed Luhansk People's Republic recorded four Ukrainian violations of the truce within the republic boundaries. The Ukrainian military used small arms, heavy machine guns, antitank rocket launchers, 73 mm antitank rocket launchers, 82 mm mortars, 120 mm mortars and BMP-1 armoured vehicles to attack pro-Russian forces at Sokilnyky, Mariivka, Kalynivka, Sentianivka and Kalynove. According to the information provided by the press-centre of the JFO in the evening, pro-Russian military had opened fire on positions of Ukrainian troops on 9 occasions, as a result, one Ukrainian serviceman was wounded; one Ukrainian soldier was reported missing in action. By the end of the day total 14 ceasefire violations were registered by the Ukrainian side of the conflict. Sources from the self-styled Luhansk People's Republic said that an attempt to broke through the demarcation line by Ukrainian infantry at Sokilnyky was thwarted when the group became stranded in a minefield. In Donetsk city, local authorities reported a series of Ukrainian violations of the truce by evening. Staromykhailivka, Trudivske, Spartak, Mykhailivka, Kruta Balka, Yasynuvata, Vasiilivka and Kashtanove, in the surroundings of Donetsk city, Holmivsky, Zaitseve and Dolomitne, in the area of Horlivka, and Uzhivka, in the region of Mariupol, came under hostile fire. In the main incidents, BMP-2 armoured vehicles from Verkhnyotoretske, Vodiane and Travneve attacked pro-Russian positions at Mykhailivka, Uzhivka and Holmivsky. BMP-1 armoured vehicles from Novoluhanske shelled meanwhile Dolomitne. Kruta Balka and Kashtanove received fire from ZU-23-2 antiaircraft guns. According to the information provided by the spokesman of the Ukrainian operational headquarters in the morning, pro-Russian troops had opened fire on 14 occasions on Ukrainian positions the previous day (including on 9 occasions in Donetsk region and on 5 occasions in Luhansk region); the fire was returned on 8 occasions. By noon of 30 November one ceasefire violation was registered. The spokesman of the Ministry of Defence confirmed at noon that one Ukrainian serviceman was wounded and another went missing in action in the Donbass region on 29 November. Pro-Russian authorities at Donetsk city reported 18 Ukrainian violations of the ceasefire in 13 locations using small arms, heavy machine guns, automatic grenade launchers, 73 mm antitank recoilless rifles, 120 mm mortars, antiaircraft guns, armoured personnel carriers and armoured fighting vehicles. In the course of the past week, Ukrainian forces broke the ceasefire 135 times, firing 59 rounds from 82 mm and 120 mm mortars and using armoured fighting vehicles on several occasions. Officials from the self-proclaimed Luhansk People's Republic recorded four Ukrainian violations of the truce within the republic boundaries. The Ukrainian miliitary used small arms, heavy machine guns, 73 mm antitank recoilless rifles, 82 mm and 120 mm mortars to attack pro-Russian forces at Lohvynove, Zolote, Mariivka, Kalynove and Pryshyb. The press-centre of the JFO reported in the evening 4 instances of the ceasefire violation by pro-Russian military. By the end of the day total 6 ceasefire violations were registered with no casualties on the Ukrainian side. A number of Ukrainian attacks on pro-Russian forces were reported by separatists authorities at Donetsk city by evening. Spartak, Yasynuvata, Kruta Balka, Trudivske, Staromykhailivka and Volvo Center, in the outskirts of Donetsk city, Zaitseve and Gagarinmining complex, in the area of Horlivka, and, in the region of Mariupol, Sakhanka and Novoshyrokivske became the target of Ukrainian forces. In the main incidents, ZU-23-2 antiaircraft guns were fired at Yasynuvata, while 73 mm antitank recoilless guns were used to shell Spartak, Sakhanka and Novoshyrokivske. ^ "Зведення щодо обстановки в районі проведення операції Об'єднаних сил станом на 07:00 1 листопада 2018 року" (in Ukrainian). MoD. 1 November 2018. Retrieved 1 November 2018. ^ "ВСУ обстреляли Горловку, Крутую Балку, Спартак, Донецк, Старомихайловку, Октябрь, Ленинское, Коминтерново, Саханку - СЦКК". 1 November 2018. Retrieved 1 November 2018. ^ 24, Донецк. "Оперативная сводка за сутки с 31 октября на 01 ноября от НМ ЛНР". Донецк 24 (in Russian). Retrieved 2 November 2018. ^ "Операція об'єднаних сил / Joint forces operation | Зведення станом на 18:00 1 листопада 2018 року" (in Ukrainian). Press-centre of the JFO HQ. 1 November 2018. Retrieved 1 November 2018. ^ a b "Зведення щодо обстановки в районі проведення операції Об'єднаних сил станом на 07:00 02 листопада 2018 року" (in Ukrainian). MoD. 2 November 2018. Retrieved 2 November 2018. ^ "Militants launched 20 attacks on Ukrainian troops in Donbas in last day". Ukrinform. 2 November 2018. Retrieved 2 November 2018. ^ a b c "Брифінг речника Міністерства оборони України щодо обстановки в районі проведення операції Об'єднаних сил" (in Ukrainian). MoD. 2 November 2018. Retrieved 2 November 2018. ^ 24, Донецк. "Сводка нарушений режима прекращения огня с 1 ноября по 2 ноября - СЦКК". Донецк 24 (in Russian). Retrieved 2 November 2018. ^ 24, Донецк. "ВСУ за неделю более 140 раз нарушили перемирие, выпустив по ДНР 1201 боеприпас". Донецк 24 (in Russian). Retrieved 6 November 2018. ^ 24, Донецк. "Оперативная сводка за сутки с 1 ноября на 2 ноября от НМ ЛНР". Донецк 24 (in Russian). Retrieved 2 November 2018. ^ "Операція об'єднаних сил / Joint forces operation | Зведення станом на 18:00 2 листопада 2018 року" (in Ukrainian). Press-centre of the JFO HQ. 2 November 2018. Retrieved 2 November 2018. ^ a b "Зведення щодо обстановки в районі проведення операції Об'єднаних сил станом на 07:00 03 листопада 2018 року" (in Ukrainian). MoD. 3 November 2018. Retrieved 3 November 2018. ^ "Militants launched 22 attacks on Ukrainian troops in Donbas in last day". Ukrinform. 3 November 2018. Retrieved 3 November 2018. ^ "За сутки ВСУ применили по территории Республики более 230 боеприпасов - СЦКК". 3 November 2018. Retrieved 3 November 2018. ^ 24, Донецк. "Оперативная сводка за сутки с 2 ноября на 3 ноября от НМ ЛНР". Донецк 24 (in Russian). Retrieved 3 November 2018. ^ "Зведення щодо обстановки в районі проведення операції Об'єднаних сил станом на 18:00 3 листопада 2018 року" (in Ukrainian). MoD. 3 November 2018. Retrieved 3 November 2018. ^ a b "Зведення щодо обстановки в районі проведення операції Об'єднаних сил станом на 07:00 04 листопада 2018 року" (in Ukrainian). MoD. 4 November 2018. Retrieved 4 November 2018. ^ "Горловка, Ясиноватая, Донецк были обстреляны ВСУ - СЦКК". 4 November 2018. Retrieved 4 November 2018. ^ 24, Донецк. "Оперативная сводка за сутки с 3 на 4 ноября от НМ ЛНР". Донецк 24 (in Russian). Retrieved 4 November 2018. ^ "Зведення щодо обстановки в районі проведення операції Об'єднаних сил станом на 18:00 04 листопада 2018 року" (in Ukrainian). MoD. 4 November 2018. Retrieved 4 November 2018. ^ a b "Зведення щодо обстановки в районі проведення операції Об'єднаних сил станом на 07:00 05 листопада 2018 року" (in Ukrainian). MoD. 5 November 2018. Retrieved 5 November 2018. ^ "Militants launched 18 attacks on Ukrainian troops in Donbas in last day". Ukrinform. 5 November 2018. Retrieved 5 November 2018. One Ukrainian serviceman was killed, another four were wounded in last day. ^ "Kyiv Says Ukrainian Soldier, Three Separatist Fighters Killed In East". RFE/RL. 5 November 2018. Retrieved 5 November 2018. ^ 24, Донецк. "Зафиксированы многочисленные обстрелы со стороны ВСУ по территории ДНР". Донецк 24 (in Russian). Retrieved 4 November 2018. ^ 24, Донецк. "Зафиксирован обстрел со стороны ВСУ по Ленинскому". Донецк 24 (in Russian). Retrieved 4 November 2018. ^ 24, Донецк. "Зафиксирован обстрел со стороны ВСУ по Старомихайловке". Донецк 24 (in Russian). Retrieved 4 November 2018. ^ 24, Донецк. "Зафиксирован обстрел со стороны ВСУ по Донецку". Донецк 24 (in Russian). Retrieved 4 November 2018. ^ "ВСУ применили крупнокалиберную артиллерию - СЦКК". 5 November 2018. Retrieved 5 November 2018. ^ 24, Донецк. "Оперативная сводка за сутки с 4 на 5 ноября от НМ ЛНР". Донецк 24 (in Russian). Retrieved 6 November 2018. ^ "Операція об'єднаних сил / Joint forces operation | Зведення станом на 18:00 05 листопада 2018 року" (in Ukrainian). Press-centre of the JFO HQ. 5 November 2018. Retrieved 5 November 2018. ^ a b "Зведення щодо обстановки в районі проведення операції Об'єднаних сил станом на 07:00 06 листопада 2018 року" (in Ukrainian). MoD. 6 November 2018. Retrieved 6 November 2018. ^ "Militants launched 14 attacks on Ukrainian troops in Donbas in last day". Ukrinform. 6 November 2018. Retrieved 6 November 2018. ^ "В зоне обстрела ВСУ оказались Горловка, Донецк, Ясиноватая и прифронтовые поселки - СЦКК". 6 November 2018. Retrieved 6 November 2018. ^ 24, Донецк. "Оперативная сводка за сутки с 5 на 6 ноября от НМ ЛНР". Донецк 24 (in Russian). Retrieved 7 November 2018. ^ "НМ ЛНР сбила очередной украинский беспилотник / The LPR People's Militia shot down yet another Ukrainian drone aircraft". 6 November 2018. Retrieved 6 March 2019. ^ "Операція об'єднаних сил / Joint forces operation | Зведення станом на 18:00 6 листопада 2018 року" (in Ukrainian). Press-centre of the JFO HQ. 6 November 2018. Retrieved 6 November 2018. ^ a b "Зведення щодо обстановки в районі проведення операції Об'єднаних сил станом на 07:00 07 листопада 2018 року" (in Ukrainian). MoD. 7 November 2018. Retrieved 7 November 2018. ^ "Militants launched 10 attacks on Ukrainian troops in Donbas in last day". Ukrinform. 7 November 2018. Retrieved 7 November 2018. One Ukrainian serviceman was killed, another four were wounded in last day. ^ a b c d "Брифінг речника Міністерства оборони України щодо обстановки в районі проведення операції Об'єднаних сил" (in Ukrainian). MoD. 7 November 2018. Retrieved 7 November 2018. ^ "В зоне обстрела ВСУ оказались Горловка, Зайцево, Донецк, Спартак, Крутая Балка, Каштановое, Александровка, Коминтерново - СЦКК". 7 November 2018. Retrieved 7 November 2018. ^ 24, Донецк. "Оперативная сводка за сутки с 6 на 7 ноября от НМ ЛНР". Донецк 24 (in Russian). Retrieved 7 November 2018. ^ "Операція об'єднаних сил / Joint forces operation | Зведення станом на 18:00 07 листопада 2018 року" (in Ukrainian). Press-centre of the JFO HQ. 7 November 2018. Retrieved 7 November 2018. ^ a b "Зведення щодо обстановки в районі проведення операції Об'єднаних сил станом на 07:00 08 листопада 2018 року" (in Ukrainian). MoD. 8 November 2018. Retrieved 8 November 2018. ^ "Militants launched 19 attacks on Ukrainian troops in Donbas in last day". Ukrinform. 8 November 2018. Retrieved 8 November 2018. ^ "В зоне обстрела со стороны ВСУ оказались Зайцево, Ясиноватая, Васильевка, Каштановое, Крутая Балка, Спартак, Донецк, Саханка - СЦКК". 8 November 2018. Retrieved 8 November 2018. ^ 24, Донецк. "Оперативная сводка за сутки с 7 на 8 ноября от НМ ЛНР". Донецк 24 (in Russian). Retrieved 8 November 2018. ^ "Зведення щодо обстановки в районі проведення операції Об'єднаних сил станом на 18:00 8 листопада 2018 року" (in Ukrainian). MoD. 8 November 2018. Retrieved 8 November 2018. ^ a b "Зведення щодо обстановки в районі проведення операції Об'єднаних сил станом на 07:00 09 листопада 2018 року" (in Ukrainian). MoD. 9 November 2018. Retrieved 9 November 2018. ^ "В зоне обстрела со стороны ВСУ оказались Горловка, Ясиноватая, Васильевка, Минеральное, Каштановое, Крутая Балка, Спартак, Донецк, Старомихайловка, Ленинское - СЦКК". 9 November 2018. Retrieved 9 November 2018. ^ "СБУ готовит провокации в Азовском море с потоплением иностранных судов". News Front - Новостной Фронт. Новости Мира России Украины (in Russian). Retrieved 10 November 2018. ^ 24, Донецк. "Оперативная сводка за сутки с 8 на 9 ноября от НМ ЛНР". Донецк 24 (in Russian). Retrieved 10 November 2018. ^ "Операція об'єднаних сил / Joint forces operation | Зведення станом на 18:00 09 листопада 2018 року" (in Ukrainian). Press-centre of the JFO HQ. 9 November 2018. Retrieved 9 November 2018. ^ a b "Зведення щодо обстановки в районі проведення операції Об'єднаних сил станом на 07:00 10 листопада 2018 року" (in Ukrainian). MoD. 10 November 2018. Retrieved 10 November 2018. ^ "Militants launched nine attacks on Ukrainian troops in Donbas in last day". Ukrinform. 10 November 2018. Retrieved 10 November 2018. ^ 24, Донецк. "Сводка нарушений режима прекращения огня с 9 по 10 ноября - СЦКК". Донецк 24 (in Russian). Retrieved 10 November 2018. ^ 24, Донецк. "Оперативная сводка за сутки с 9 на 10 ноября от НМ ЛНР". Донецк 24 (in Russian). Retrieved 10 November 2018. ^ "Зведення щодо обстановки в районі проведення операції Об'єднаних сил станом на 18:00 10 листопада 2018 року" (in Ukrainian). MoD. 10 November 2018. Retrieved 10 November 2018. ^ "JFO: Four Ukrainian soldiers blown up on landmine near Svitlodarsk, two killed". UNIAN. 10 November 2018. Retrieved 11 November 2018. ^ a b "Зведення щодо обстановки в районі проведення операції Об'єднаних сил станом на 07:00 09 листопада 2018 року" (in Ukrainian). MoD. 11 November 2018. Retrieved 11 November 2018. ^ 24, Донецк. "Сводка нарушений режима прекращения огня с 10 по 11 ноября - СЦКК". Донецк 24 (in Russian). Retrieved 12 November 2018. ^ 24, Донецк. "Оперативная сводка за сутки с 10 на 11 ноября от НМ ЛНР". Донецк 24 (in Russian). Retrieved 12 November 2018. ^ "Зведення щодо обстановки в районі проведення операції Об'єднаних сил станом на 18:00 11 листопада 2018 року" (in Ukrainian). MoD. 11 November 2018. Retrieved 11 November 2018. ^ a b "Зведення щодо обстановки в районі проведення операції Об'єднаних сил станом на 07:00 12 листопада 2018 року" (in Ukrainian). MoD. 12 November 2018. Retrieved 12 November 2018. ^ "Militants launched seven attacks on Ukrainian troops in Donbas in last day". Ukrinform. 12 November 2018. Retrieved 12 November 2018. ^ "West urges Russia to scrap separatist elections in Ukraine". The Irish Times. Retrieved 12 November 2018. ^ "Separatists In Ukraine's Donetsk Choose Zakharchenko Successor". RadioFreeEurope/RadioLiberty. Retrieved 12 November 2018. ^ 24, Донецк. "Сводка нарушений режима прекращения огня с 11 по 12 ноября - СЦКК". Донецк 24 (in Russian). Retrieved 12 November 2018. ^ 24, Донецк. "Оперативная сводка за сутки с 11 на 12 ноября от НМ ЛНР". Донецк 24 (in Russian). Retrieved 12 November 2018. ^ "Зведення щодо обстановки в районі проведення операції Об'єднаних сил станом на 18:00 12 листопада 2018 року" (in Ukrainian). MoD. 12 November 2018. Retrieved 12 November 2018. ^ a b "Зведення щодо обстановки в районі проведення операції Об'єднаних сил станом на 07:00 13 листопада 2018 року" (in Ukrainian). MoD. 13 November 2018. Retrieved 13 November 2018. ^ 24, Донецк. "Зафиксирован обстрел со стороны ВСУ по Зайцево (южное)". Донецк 24 (in Russian). Retrieved 13 November 2018. ^ 24, Донецк. "Зафиксирован обстрел со стороны ВСУ по Спартаку". Донецк 24 (in Russian). Retrieved 13 November 2018. ^ "ВСУ обстреляли поселок шахты "Трудовская", Саханку, Ленинское, Спартак - СЦКК". 12 November 2018. Retrieved 12 November 2018. ^ "ВСУ обстреляли Старомихайловку - СЦКК". 12 November 2018. Retrieved 12 November 2018. ^ "Briefing of the English spokesman of the Ministry of Defence of Ukraine (video)". MoD. 12 November 2018. Retrieved 24 November 2018. ^ "В зоне обстрела со стороны ВФУ оказались Зайцево, Донецк, Спартак, Старомихайловка, Ленинское, Коминтерново - СЦКК". 13 November 2018. Retrieved 13 November 2018. ^ 24, Донецк. "Оперативная сводка за сутки с 12 на 13 ноября от НМ ЛНР". Донецк 24 (in Russian). Retrieved 14 November 2018. ^ "Зведення щодо обстановки в районі проведення операції Об'єднаних сил станом на 18:00 13 листопада 2018 року" (in Ukrainian). MoD. 13 November 2018. Retrieved 13 November 2018. ^ a b "Зведення щодо обстановки в районі проведення операції Об'єднаних сил станом на 07:00 14 листопада 2018 року" (in Ukrainian). MoD. 14 November 2018. Retrieved 14 November 2018. ^ "Militants launched eight attacks on Ukrainian troops in Donbas in last day". Ukrinform. 14 November 2018. Retrieved 14 November 2018. ^ a b c d "Брифінг речника Міністерства оборони України щодо обстановки в районі проведення операції Об'єднаних сил" (in Ukrainian). MoD. 14 November 2018. Retrieved 14 November 2018. ^ "В зоне обстрела со стороны ВФУ оказались Горловка, Ясиноватая, Спартак, Донецк, Коминтерново, Саханка - СЦКК". 14 November 2018. Retrieved 14 November 2018. ^ 24, Донецк. "Оперативная сводка за сутки с 13 на 14 ноября от НМ ЛНР". Донецк 24 (in Russian). Retrieved 15 November 2018. ^ "Зведення щодо обстановки в районі проведення операції Об'єднаних сил станом на 18:00 14 листопада 2018 року" (in Ukrainian). MoD. 14 November 2018. Retrieved 14 November 2018. ^ a b "Зведення щодо обстановки в районі проведення операції Об'єднаних сил станом на 07:00 15 листопада 2018 року" (in Ukrainian). MoD. 15 November 2018. Retrieved 15 November 2018. ^ "Militants launched 16 attacks on Ukrainian troops in Donbas in last day". Ukrinform. 15 November 2018. Retrieved 15 November 2018. ^ 24, Донецк. "Сводка нарушений режима прекращения огня с 14 по 15 ноября - СЦКК". Донецк 24 (in Russian). Retrieved 16 November 2018. ^ 24, Донецк. "Оперативная сводка за сутки с 14 на 15 ноября от НМ ЛНР". Донецк 24 (in Russian). Retrieved 16 November 2018. ^ "Зведення щодо обстановки в районі проведення операції Об'єднаних сил станом на 18:00 15 листопада 2018 року" (in Ukrainian). MoD. 15 November 2018. Retrieved 15 November 2018. ^ a b "Зведення щодо обстановки в районі проведення операції Об'єднаних сил станом на 07:00 16 листопада 2018 року" (in Ukrainian). MoD. 16 November 2018. Retrieved 16 November 2018. ^ "Militants launched 16 attacks on Ukrainian troops in Donbas in last day". Ukrinform. 16 November 2018. Retrieved 16 November 2018. ^ "ВСУ ведут огонь из минометов по территории Республики - СЦКК". 16 November 2018. Retrieved 16 November 2018. ^ "В ДНР зафиксировано порядка сотни обстрелов со стороны ВСУ". News Front - Новостной Фронт. Новости Мира России Украины (in Russian). Retrieved 19 November 2018. ^ 24, Донецк. "Оперативная сводка за сутки с 15 на 16 ноября от НМ ЛНР". Донецк 24 (in Russian). Retrieved 16 November 2018. ^ "Зведення щодо обстановки в районі проведення операції Об'єднаних сил станом на 18:00 16 листопада 2018 року" (in Ukrainian). MoD. 16 November 2018. Retrieved 16 November 2018. ^ a b "Зведення щодо обстановки в районі проведення операції Об'єднаних сил станом на 07:00 17 листопада 2018 року" (in Ukrainian). MoD. 17 November 2018. Retrieved 17 November 2018. ^ a b c d "Брифінг речника Міністерства оборони України щодо обстановки в районі проведення операції Об'єднаних сил" (in Ukrainian). MoD. 17 November 2018. Retrieved 17 November 2018. ^ a b "Зведення щодо обстановки в районі проведення операції Об'єднаних сил станом на 18:00 17 листопада 2018 року" (in Ukrainian). MoD. 17 November 2018. Retrieved 17 November 2018. ^ 24, Донецк. "Сводка нарушений режима прекращения огня с 16 по 17 ноября - СЦКК". Донецк 24 (in Russian). Retrieved 17 November 2018. ^ 24, Донецк. "Оперативная сводка за сутки с 16 на 17 ноября от НМ ЛНР". Донецк 24 (in Russian). Retrieved 17 November 2018. ^ a b "Зведення щодо обстановки в районі проведення операції Об'єднаних сил станом на 07:00 18 листопада 2018 року" (in Ukrainian). MoD. 18 November 2018. Retrieved 18 November 2018. ^ 24, Донецк. "Сводка нарушений режима прекращения огня с 17 по 18 ноября - СЦКК". Донецк 24 (in Russian). Retrieved 19 November 2018. ^ 24, Донецк. "Оперативная сводка за сутки с 17 на 18 ноября от НМ ЛНР". Донецк 24 (in Russian). Retrieved 19 November 2018. ^ "Зведення щодо обстановки в районі проведення операції Об'єднаних сил станом на 18:00 18 листопада 2018 року" (in Ukrainian). MoD. 18 November 2018. Retrieved 18 November 2018. ^ a b "Зведення щодо обстановки в районі проведення операції Об'єднаних сил станом на 07:00 19листопада 2018 року" (in Ukrainian). MoD. 19 November 2018. Retrieved 19 November 2018. ^ "Militants launched 16 attacks on Ukrainian troops in Donbas in last day". Ukrinform. 19 November 2018. Retrieved 19 November 2018. ^ "В зоне обстрела со стороны ВСУ оказались Горловка, Ясиноватая, Крутая Балка, Спартак, Донецк, Старомихайловка, Коминтерново, Саханка - СЦКК". 19 November 2018. Retrieved 19 November 2018. ^ 24, Донецк. "Оперативная сводка за сутки с 18 на 19 ноября от НМ ЛНР". Донецк 24 (in Russian). Retrieved 19 November 2018. ^ "Зведення щодо обстановки в районі проведення операції Об'єднаних сил станом на 18:00 19 листопада 2018 року" (in Ukrainian). MoD. 19 November 2018. Retrieved 19 November 2018. ^ a b "Зведення щодо обстановки в районі проведення операції Об'єднаних сил станом на 07:00 20 листопада 2018 року" (in Ukrainian). MoD. 20 November 2018. Retrieved 20 November 2018. ^ "Militants launched 21 attacks on Ukrainian troops in Donbas in last day". Ukrinform. 20 November 2018. Retrieved 20 November 2018. ^ "Ukraine's air defense unit shoots down Russian Orlan-10 drone in Donbas (Photo)". Retrieved 21 November 2018. ^ "IR summary: Russian "curators" actively spread out the rumors about "offensive of the AFU" in the headquarters of the "1st AC DPR"". Information Resistance. 23 November 2018. ^ "Briefing of the English spokesman of the Ministry of Defence of Ukraine (video)". MoD. 19 November 2018. Retrieved 24 November 2018. ^ 24, Донецк. "Сводка нарушений режима прекращения огня с 19 по 20 ноября - СЦКК". Донецк 24 (in Russian). Retrieved 20 November 2018. ^ 24, Донецк. "Оперативная сводка за сутки с 19 на 20 ноября от НМ ЛНР". Донецк 24 (in Russian). Retrieved 20 November 2018. ^ "Зведення щодо обстановки в районі проведення операції Об'єднаних сил станом на 18:00 20 листопада 2018 року" (in Ukrainian). MoD. 20 November 2018. Retrieved 20 November 2018. ^ a b "Зведення щодо обстановки в районі проведення операції Об'єднаних сил станом на 07:00 21 листопада 2018 року" (in Ukrainian). MoD. 21 November 2018. Retrieved 21 November 2018. ^ "Militants launched six attacks on Ukrainian troops in Donbas in last day". Ukrinform. 21 November 2018. Retrieved 21 November 2018. ^ "В зоне обстрела со стороны ВСУ оказались Горловка, Гольмовский, Зайцево, Ясиноватая, Крутая Балка, Спартак, Александровка - СЦК". 21 November 2018. Retrieved 21 November 2018. ^ 24, Донецк. "Оперативная сводка за сутки с 20 на 21 ноября от НМ ЛНР". Донецк 24 (in Russian). Retrieved 21 November 2018. ^ "Зведення щодо обстановки в районі проведення операції Об'єднаних сил станом на 18:00 21 листопада 2018 року" (in Ukrainian). MoD. 21 November 2018. Retrieved 21 November 2018. ^ a b "Зведення щодо обстановки в районі проведення операції Об'єднаних сил станом на 07:00 22 листопада 2018 року" (in Ukrainian). MoD. 22 November 2018. Retrieved 22 November 2018. ^ "Militants launched 11 attacks on Ukrainian troops in Donbas in last day". Ukrinform. 22 November 2018. Retrieved 22 November 2018. ^ a b c d "Брифінг речника Міністерства оборони України щодо обстановки в районі проведення операції Об'єднаних сил" (in Ukrainian). MoD. 22 November 2018. Retrieved 22 November 2018. ^ "В зоне обстрела ВФУ оказались поселок шахты им. Гагарина в Горловке, Ясиноватая, Крутая Балка, Спартак, районы Терминала, Вольво-центра, поселка шахты "Трудовская" в Донецке, Еленовка, Октябрь, Ленинское, Коминтерново, Саханка". 22 November 2018. Retrieved 22 November 2018. ^ 24, Донецк. "Оперативная сводка за сутки с 21 на 22 ноября от НМ ЛНР". Донецк 24 (in Russian). Retrieved 22 November 2018. ^ "Операція об'єднаних сил / Joint forces operation | Зведення станом на 18:00 22 листопада 2018 року" (in Ukrainian). Press-centre of the JFO HQ. 22 November 2018. Retrieved 22 November 2018. ^ a b "Зведення щодо обстановки в районі проведення операції Об'єднаних сил станом на 07:00 23 листопада 2018 року" (in Ukrainian). MoD. 23 November 2018. Retrieved 23 November 2018. ^ "Militants launched four attacks on Ukrainian troops in Donbas in last day". Ukrinform. 23 November 2018. Retrieved 23 November 2018. ^ "В зоне обстрела ВФУ оказались Зайцево, Гольмовский, поселок шахты им. Гагарина в Горловке, Ясиноватая, Крутая Балка, Спартак, район терминала, поселок шахты "Трудовская", Александровка в Донецке, Саханка". 23 November 2018. Retrieved 23 November 2018. ^ 24, Донецк. "Оперативная сводка за сутки с 22 на 23 ноября от НМ ЛНР". Донецк 24 (in Russian). Retrieved 24 November 2018. ^ "Зведення щодо обстановки в районі проведення операції Об'єднаних сил станом на 18:00 23 листопада 2018 року" (in Ukrainian). MoD. 23 November 2018. Retrieved 23 November 2018. ^ a b "Зведення щодо обстановки в районі проведення операції Об'єднаних сил станом на 07:00 24 листопада 2018 року" (in Ukrainian). MoD. 24 November 2018. Retrieved 24 November 2018. ^ a b c d "Брифінг речника Міністерства оборони України щодо обстановки в районі проведення операції Об'єднаних сил" (in Ukrainian). MoD. 24 November 2018. Retrieved 24 November 2018. ^ 24, Донецк. "Сводка нарушений режима прекращения огня с 22 по 23 ноября - СЦКК". Донецк 24 (in Russian). Retrieved 24 November 2018. ^ "Донбасс. Оперативная лента военных событий 24.11.2018 » nashagazeta.net". nashagazeta.net. Retrieved 25 November 2018. ^ "Зведення щодо обстановки в районі проведення операції Об'єднаних сил станом на 18:00 24 листопада 2018 року" (in Ukrainian). MoD. 24 November 2018. Retrieved 24 November 2018. ^ a b "Зведення щодо обстановки в районі проведення операції Об'єднаних сил станом на 07:00 25 листопада 2018 року" (in Ukrainian). MoD. 25 November 2018. Retrieved 25 November 2018. ^ "Обстрелом ВФУ были обесточены несколько населенных пунктов - СЦКК". 25 November 2018. Retrieved 25 November 2018. ^ a b 24, Донецк. "Сводка нарушений режима прекращения огня с 25 по 26 ноября - СЦКК". Донецк 24 (in Russian). Retrieved 27 November 2018. ^ "Зведення щодо обстановки в районі проведення операції Об'єднаних сил станом на 18:00 25 листопада 2018 року" (in Ukrainian). MoD. 25 November 2018. Retrieved 25 November 2018. ^ a b "Зведення щодо обстановки в районі проведення операції Об'єднаних сил станом на 07:00 26 листопада 2018 року" (in Ukrainian). MoD. 26 November 2018. Retrieved 26 November 2018. ^ "Militants launched 16 attacks on Ukrainian troops in Donbas in last day". Ukrinform. 26 November 2018. Retrieved 26 November 2018. ^ "Состояние жителя Пантелеймоновки, раненого при обстреле ВФУ, стабильное". 26 November 2018. Retrieved 26 November 2018. ^ Andrew Osborn (25 November 2018). "Russia blocks Ukrainian navy from entering Sea of Azov". Reuters. Retrieved 25 November 2018. ^ MATTHEW BODNER (25 November 2018). "Russia, Ukraine trade blame over naval incident near Crimea". Moscow: (AP). Retrieved 25 November 2018. ^ "Russia seizes Ukrainian naval ships". BBC News. 25 November 2018. Retrieved 26 November 2018. ^ "Kyiv Says Russia Attacked Ukrainian Navy Ships, Seized Three In Black Sea". RadioFreeEurope/RadioLiberty. Retrieved 25 November 2018. ^ "All three Ukrainian Navy vessels that violated Russia's border detained in Black Sea". TASS (in Russian). Retrieved 26 November 2018. ^ "Twenty-three Ukrainians on board three boats captured by Russia, contact with them lost". UNIAN. 25 November 2018. Retrieved 26 November 2018. ^ "Ukraine's Navy placed on alert". UNIAN. 26 November 2018. Retrieved 26 November 2018. ^ "Збройні Сили України приведені у бойову готовність "повнаˮ" (in Ukrainian). MoD. 26 November 2018. Retrieved 26 November 2018. На підставі рішення Ради національної безпеки і оборони України щодо введення правового режиму воєнного стану, начальник Генерального штабу – Головнокомандувач Збройних Сил України віддав розпорядження щодо приведення з’єднань і частин Збройних Сил України у бойову готовність “повнаˮ. ^ Pavel Aksenov (26 November 2018). "Инцидент в Керченском проливе: кто прав?" (in Russian). BBC Russian Service. Retrieved 26 November 2018. ^ 24, Донецк. "Оперативная сводка за сутки с 25 на 26 ноября от НМ ЛНР". Донецк 24 (in Russian). Retrieved 26 November 2018. ^ "Операція об'єднаних сил / Joint forces operation | Зведення станом на 18:00 26 листопада 2018 року" (in Ukrainian). Press-centre of the JFO HQ. 26 November 2018. Retrieved 26 November 2018. ^ a b "Зведення щодо обстановки в районі проведення операції Об'єднаних сил станом на 07:00 27 листопада 2018 року" (in Ukrainian). MoD. 27 November 2018. Retrieved 27 November 2018. ^ a b "Situation Update, east of Ukraine as of morning, November 27, 2018". MoD. 27 November 2018. Retrieved 27 November 2018. ^ "В ДНР уничтожили украинский беспилотник с зажигательными боеприпасами под Горловкой". News Front - Новостной Фронт. Новости Мира России Украины (in Russian). Retrieved 1 December 2018. ^ "В зоне обстрела оказались восемь населенных пунктов Республики - СЦКК". 27 November 2018. Retrieved 27 November 2018. ^ 24, Донецк. "Оперативная сводка за сутки с 26 на 27 ноября от НМ ЛНР". Донецк 24 (in Russian). Retrieved 27 November 2018. ^ "Зведення щодо обстановки в районі проведення операції Об'єднаних сил станом на 18:00 27 листопада 2018 року" (in Ukrainian). MoD. 27 November 2018. Retrieved 27 November 2018. ^ a b "Зведення щодо обстановки в районі проведення операції Об'єднаних сил станом на 07:00 28 листопада 2018 року" (in Ukrainian). MoD. 28 November 2018. Retrieved 28 November 2018. ^ "Militants launched five attacks on Ukrainian troops in Donbas in last day". Ukrinform. 28 November 2018. Retrieved 28 November 2018. ^ "Putin Accuses Poroshenko Of Electoral Ploy As Ukraine Imposes Martial Law After Sea Clash". Simferopol, Ukraine: RFE/RL. 28 November 2018. Retrieved 28 November 2018. ^ "ВФУ вели огонь из гранатометов и бронетехники - СЦКК". 28 November 2018. Retrieved 28 November 2018. ^ Олейникова, Виктория. "Оперативная сводка за сутки с 27 на 28 августа - Республика 24 - Информационный портал Луганска и ЛНР" (in Russian). Retrieved 28 November 2018. ^ "Операція об'єднаних сил / Joint forces operation | Зведення станом на 18:00 28 листопада 2018 року" (in Ukrainian). Press-centre of the JFO HQ. 28 November 2018. Retrieved 28 November 2018. ^ a b "Зведення щодо обстановки в районі проведення операції Об'єднаних сил станом на 07:00 29 листопада 2018 року" (in Ukrainian). MoD. 29 November 2018. Retrieved 29 November 2018. ^ "Militants launched 14 attacks on Ukrainian troops in Donbas in last day". Ukrinform. 29 November 2018. Retrieved 29 November 2018. ^ a b c "Брифінг речника Міністерства оборони України щодо обстановки в районі проведення операції Об'єднаних сил" (in Ukrainian). MoD. 29 November 2018. Retrieved 29 November 2018. ^ 24, Донецк. "Сводка нарушений режима прекращения огня с 28 по 29 ноября - СЦКК". Донецк 24 (in Russian). Retrieved 29 November 2018. ^ 24, Донецк. "Оперативная сводка за сутки с 28 на 29 ноября от НМ ЛНР". Донецк 24 (in Russian). Retrieved 29 November 2018. ^ "Зведення щодо обстановки в районі проведення операції Об'єднаних сил станом на 18:00 29 листопада 2018 року" (in Ukrainian). MoD. 29 November 2018. Retrieved 29 November 2018. ^ a b "Зведення щодо обстановки в районі проведення операції Об'єднаних сил станом на 07:00 30 листопада 2018 року" (in Ukrainian). MoD. 30 November 2018. Retrieved 30 November 2018. ^ a b "Situation Update, east of Ukraine as of morning, November 30, 2018". MoD. 30 November 2018. Retrieved 30 November 2018. ^ 24, Донецк. "Срочное заявление официального представителя НМ ЛНР". Донецк 24 (in Russian). Retrieved 29 November 2018. ^ "В зоне обстрела ВФУ был ряд населенных пунктов, повреждены жилые дома - СЦКК". 30 November 2018. Retrieved 30 November 2018. ^ "В ДНР зафиксировано более сотни обстрелов со стороны киевских боевиков". News Front - Новостной Фронт. Новости Мира России Украины (in Russian). Retrieved 1 December 2018. ^ Садыкова, Алия. "Донбасс: ВСУ за сутки выпустили по ЛНР 70 снарядов". Федеральное агентство новостей No.1. Retrieved 1 December 2018. ^ "Зведення щодо обстановки в районі проведення операції Об'єднаних сил станом на 18:00 30 листопада 2018 року" (in Ukrainian). MoD. 30 November 2018. Retrieved 30 November 2018. ^ "Militants launched six attacks on Ukrainian troops in Donbas in last day". Ukrinform. 1 December 2018. Retrieved 1 December 2018.